Governor Andrew M. Cuomo today announced record-breaking growth and traffic achievements in digital service, one year after the launch of the official New York State website. Comparatively, users doubled, mobile traffic tripled, pageviews quadrupled, and the rate at which visitors leave the website is down by over 20 percent. "When we redesigned NY.Gov, we put New Yorkers at the center and made it easier than ever to utilize and learn more about government services," said Governor Cuomo. "The figures over the last year prove that when we use technology to transform how government communicates, it can have a positive impact on people’s lives. Our strategy is working, and we will continue to use technology to engage New Yorkers and move our state forward in the days ahead." The improvements are the result of the Governor’s modernization of NY.Gov, a technology initiative focused on redesigning digital government services to reduce bureaucracy, enhance performance, strengthen security, make State services more accessible and put people first. The new website was unveiled on November 12, 2014, featuring a complete overhaul of design and technology architecture for the first time since 1999. The improvements and actual metrics are described in greater detail below. Following relaunch, more people than ever before are using NY.Gov. 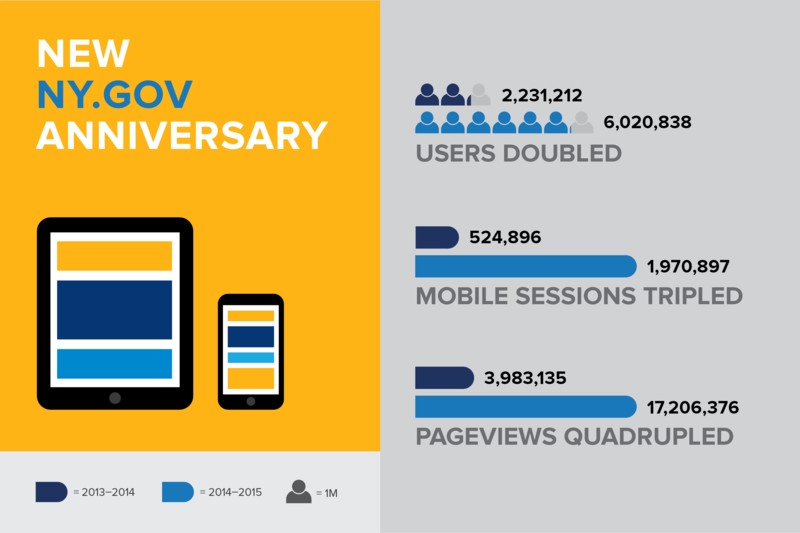 In the year before launch (November 12, 2013 – November 9, 2013), NY.Gov served 2,321,212 users, and post-launch (November 12, 2014 – November 9, 2015) the site had 6,020,838 users, nearly tripling its audience in one year. As search engines Google and Bing continue to be the top referring external sites to NY.Gov, this suggests better indexing and search engine optimization thanks to better website structures and best practices. Other contributing factors include improved mobile access, translation to dozens of languages and better accessibility for the visually impaired. While the old NY.Gov was virtually impossible to use on a mobile phone, the new website is fully responsive, enabling easy access via any digital device, from smartphone to tablet to desktop computer. As a result of the enhanced mobile experience, mobile use has increased more than 275 percent, from 524,896 session pre-launch 1,970,897 sessions from sessions. Today, more than 23 percent of traffic to NY.Gov is from a mobile device. Since the website overhaul, the number of overall pageviews of NY.Gov has increased over 300 percent, going from 3,983,135 prelaunch to 17,206,376 post-launch. The significant pageview gains reflect the combination of success across multiple metrics: more unique visitors, improved search functionality, more engaging, timely information, a new services section, faster load times and overall performance and greater language and ADA accessibility. The Services section on NY.Gov has been the most visited page every week since launch, underscoring the Governor’s commitment to customer service. 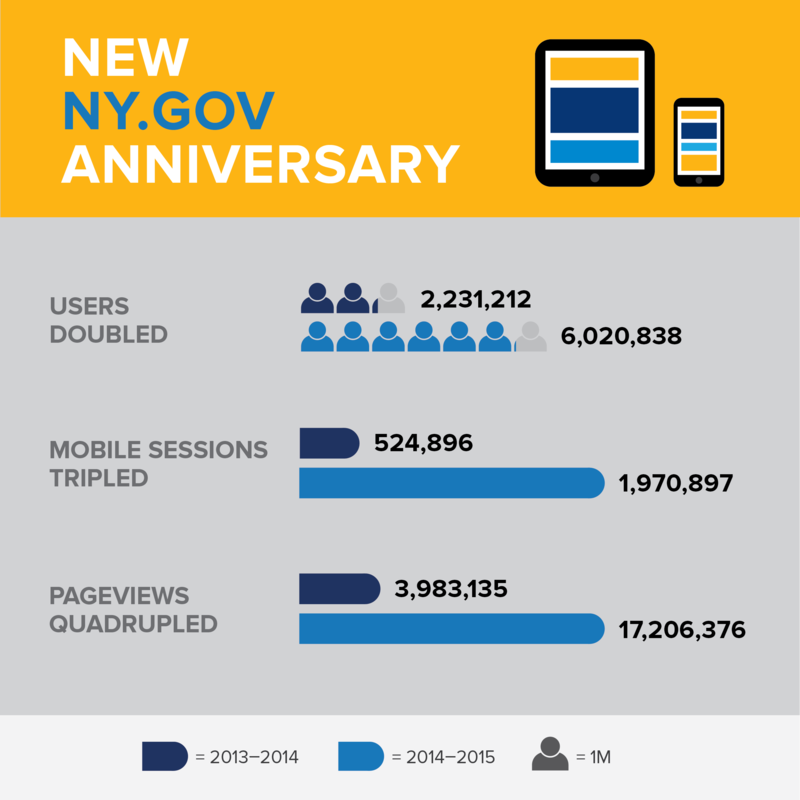 In addition, New York State’s social media audience has expanded by over one million since 2014, and now serves an audience of over five million, helping to connect more of the public to services and information on NY.Gov than ever before. The figures over the last year prove that when we use technology to transform how government communicates, it can have a positive impact on people’s lives. Information on NY.Gov is now more timely and up-to-date than in the past, as the digital team can now publish more quickly and effectively thanks to technology changes. For example, today the team can publish press releases in ¼ of the time (30 minutes pre-launch compared to 7 minutes post-launch), and customize and launch interactive program pages in 1/60th of the time (from 30-100 hours pre-launch to 30 minutes post-launch). These improvements are the result of the deployment and customization of a more usable Content Management System, Drupal, and easily customized program page templates in use by the State’s digital team. In addition to savings in labor and IT resources, Drupal is an open source platform with a significantly lower cost to the State—while maintaining the highest security standards through the Acquia Platform. The rate at which people leave the NY.Gov after viewing a single page has also decreased since launch, going from 81.4 percent to 60.4 percent, a decrease of over 20 percent. This means that people who arrive on NY.Gov are staying longer to explore different services, find more information, or search for different resources. Led by Chief Digital Officer Rachel Haot, the NY.Gov digital team takes a highly analytical approach to operations and strategy, analyzing qualitative and quantitative metrics on a monthly basis to identify strengths and weaknesses of New York State’s digital assets. NY.Gov was designed in partnership with New York-based design firm Code and Theory, and is supported by Drupal cloud services company Acquia. NY.Gov is led by NY.Gov General Manager Melanie Galinski and User Experience Manager Jessica Harrison, and overall digital media strategy is led by Director of Digital Communications and Citizen Engagement Grace Cheung. Chief Digital Officer and Deputy Secretary for Technology Rachel Haot said, "Thanks to Governor Cuomo’s leadership, enormous public input and incredible efforts by New York State government and our partners, a year after the relaunch of NY.Gov, we have a lot to celebrate. I’m grateful for the Governor’s vision of redesigning digital government to make it more efficient, accessible and meaningful than ever before. It's an honor to work every day to improve digital services for New Yorkers and modernize our valuable resources. Our journey has only just begun, and the hard-working NY.Gov team will continue to build on this powerful foundation to raise the bar higher and higher." New York State Chief Information Officer Margaret Miller said, "Governor Cuomo continues to challenge the status quo and transform the way government services are delivered. We are pleased to support his vision of a citizen-centric digital New York. Through NY.Gov, a visitor no longer has to navigate a complicated maze of webpages and agencies to find what they need. This initiative is only one of many the Governor has implemented to make government more accessible to citizens and we look forward to leveraging technology, innovation, and collaboration to continue to drive New York forward." Dries Buytaert, creator of Drupal and co-founder and CTO of Boston-based Acquia said, "What New York has been able to accomplish in only a year is a remarkable testament to the power of open source solutions for government. New York is driving amazing increases in civic participation and better serving citizens through the digital experience of NY.Gov. At Acquia, we’re proud to provide a secure, open cloud platform on which the State of New York can continue to innovate and grow."